Suits for women - WomensSkirtSuits.com knows how to dress today's elegant women from head to toe, offering high-end boutique labels from the most fashionable designers, at a fraction of the cost they charge in department stores. From stylish women's skirt sets to smart women's pant suits, you'll find designer suits from Donna Vinci, Champagne, Ben Marc, John Meyer, Lisa Rene, Devine Denim, Tally Taylor, Liorah and other fabulous names in designer women's suits! Women's business suits - Take the stress out of getting dressed every morning for work with a collection of attractive power suits and professional skirt suits that mean business. Find 2 and 3 piece work suits for women from Ben Marc Executive in solid colors and complementary color combinations. WomensSkirtSuits.com also helps women maximize their career wardrobes by giving them the flexibility to create dozens of sharp looks to carry them through the work week with convenient mix and match women's suit separates! 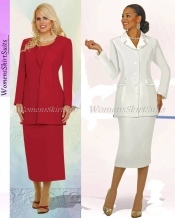 Women's church suits - Whether you're attending your regular Sunday service or a loved one's wedding ceremony, WomensSkirtSuits outfits you in a collection of ladies church suits from casual to formal in a gorgeous selection of bright and colorful hues. Find suits for women that will complement every figure featuring a selection of charming usher suits and church suits by Aussie Austine and Emily in a striking color palette ranging from neutrals of cream and navy to vibrant colors that will get you noticed, from fuchsia to dusty rose! The perfect fitting suit is a staple in any woman's wardrobe. Find the widest selection of modern suits for women that flatter both regular sizes and plus sizes elegantly and fashionably, from WomensSkirtSuits.com.